A pioneer in the American automobile industry, Elwood Haynes built one of the first automobiles powered by a gasoline internal combustion engine in 1894. In 1898 Haynes co-founded the Haynes-Apperson Automobile Company and Haynes continued to manufacture automobiles until 1924. He also held a number of metallurgical patents and built the Stellite Corporation into a multimillion dollar enterprise manufacturing an early form of stainless steel. Although his name is not as well remembered as Henry Ford, Ransom Olds, or the Duryea Brothers, Elwood Haynes was one of the pioneers of the automobile age. While the debate has continued on who built the first automobile in America, Haynes was one of the first to make a successful trial run of a gasoline internal combustion-powered automobile in the United States. His mechanical innovations helped spur early automotive technology past its first challenges of durability and performance. After winning a number of awards in motor vehicle endurance contests in the 1890s, Haynes used his reputation to start one of the first car companies in the United States with his partners, the Apperson brothers. Haynes eventually split from the Appersons in order to concentrate on the luxury car market, and the Haynes Automobile Company reached its sales peak in 1916. Haynes also devoted his time to metallurgical experiments with tungsten and cobalt-chrominum alloys in order to develop a lightweight yet durable and strong metal. The result, patented in 1912, was manufactured and sold as "Stellite," and Haynes's new venture quickly grossed several million dollars in sales. Haynes's fortune later ebbed due to lawsuits over the patents for Stellite and the sudden failure of the Haynes Automobile Company in 1924. Born in the east central Indiana town of Portland on October 14, 1857, Elwood Haynes was the fifth of the eight surviving children of Jacob and Hilinda Sophia Haynes. The family was one of the wealthiest in the area. Jacob Haynes had been born into a prosperous Massachusetts family that manufactured munitions and horse riding equipment, and he had studied at the exclusive Phillips Academy in Andover before moving west. After settling in Indiana around 1843, Jacob Haynes practiced law and eventually became a circuit judge. He also served as the county school commissioner. Most of the Haynes children excelled in their pursuits and completed their college degrees, a rare feat in an age when only a fraction of the population had access to higher education. In comparison to his siblings, Haynes was a relative failure in his early years. Although he received good marks in grammar school and demonstrated an obvious interest in scientific pursuits—conducting his own early experiments with metals by melting down spoons—he also seemed easily distracted. After finishing his primary education, Haynes did not go into high school until one opened in the area. Haynes then entered the Worcester County Free Institute of Industrial Science in 1878. The school was later named the Worcester Polytechnical Institute and achieved a reputation as one of the finest engineering and math schools in the country. Haynes struggled to make it through his first year because he was not really prepared him for the rigors of university study. Under strong pressure from his family, Haynes completed his degree in 1881. Returning to Indiana after three years in Massachusetts, Haynes got a job as a teacher in the Jay County public school system. After a year of teaching, he also served as Portland High School's principal. He enjoyed his experience as a novice teacher and made plans to continue his career at a new teachers' school established in Portland in 1883. There he taught chemistry, geometry, and other scientific subjects. In 1884 Haynes decided to pursue graduate work in chemistry at Johns Hopkins University in Baltimore, Maryland. Although his mother's death in 1885 cut short his stay in Baltimore, Haynes made good use of his time in the school's labs. A series of events in the region changed his career path soon after his return home. Early in 1886, a promising natural gas deposit was discovered in Jay County. Seizing the opportunity, Haynes and a group of investors founded the Portland Natural Gas and Oil Company by the end of 1886. Exploiting Jay County's natural gas reserves proved a somewhat speculative venture, and, like most other deposits, the reserves were exhausted within a fairly short time. In the years immediately after the discovery of natural gas in north central Indiana, however, the industry grew by leaps and bounds. While the Portland Natural Gas and Oil Company was the first to bring gas into the town, two other competitors sprung up within a year. With a promising future as a gas company executive and shareholder, Haynes felt financially secure enough to marry the woman he had courted for about ten years. Bertha Lanterman was raised in Portland, but her family relocated to Alabama when she was a teenager. She and Haynes kept in touch, and when the Lanterman family moved back to Indiana, the couple resumed their courtship. They were married on October 21, 1887, and had two children: a daughter, Bernice, born in 1892, and a son, March, in 1896. Haynes continued his scientific experiments and developed a number of innovative devices during his time with the Portland Natural Gas and Oil Company. One device improved the accuracy of gas meters, and another, something like an early home thermostat, allowed consumers to regulate the amount of gas they used. At a time when much of the public feared bringing natural gas into their home, Haynes's devices helped to foster a safer and more dependable reputation for the new service. Joining the Columbus Construction Company in 1890—a division of the Indiana Natural Gas and Oil Company—Haynes helped to build an innovative high-pressure gas pipeline to bring gas across the state. With his new position, Haynes moved his family to Kokomo, a sizable city in north-central Indiana about forty miles from Indianapolis. As early as 1891, Haynes had started to make some sketches of vehicles that would be powered by gasoline internal combustion engines. Since the mid-1880s, European inventors had tested such motor vehicles, including the Germans Gottleib Daimler and Karl Benz, who conducted successful trial runs in 1885 and 1886. In 1891, the same year that Haynes started to take the pursuit seriously, Benz offered the first automobiles for sale in Europe. 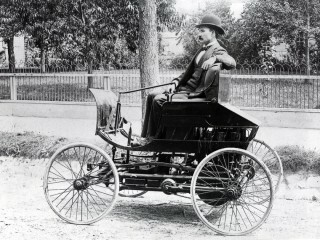 In 1893, the Duryea Brothers, Charles and Frank, claimed to have made the first automobile run in the United States in Springfield, Massachusetts; however, Haynes would later dispute their assertion. The Duryeas had essentially strapped an engine onto an existing carriage, but Haynes built a vehicle expressly designed as an automobile. While the distinction may not have mattered to some, Haynes and the Duryeas argued over the point in the years to come, particularly after they had entered the automobile manufacturing business and used the claim of being first in their advertisements. Haynes's vehicle was one of the first on American soil that deserved to be called an "automobile." After numerous experiments with a gasoline engine, Haynes meticulously designed a vehicle that was lightweight yet strong enough not to rattle apart while being driven. Using Haynes's design, the car itself was built in the Riverside Machine Shop in Kokomo, a business owned by the Apperson brothers. They pledged to keep the automobile under wraps, for Haynes did not want to publicize his work until he could be assured that it would be a success. On July 4, 1894, the car was ready for its first test run. Taking a cautious approach— for the car had almost no steering capability—Haynes had the car pulled to a road outside of town so that pedestrians and horses would not get in the way. The test run on Pumpkinvine Pike outside of Kokomo was successful, with the car, named the Pioneer, reaching speeds of about seven miles per hour. Later, Haynes redesigned the Pioneer, improved its steering, and added pneumatic tires, taking its top speed up to about 12 to 14 miles per hour. Over the next year, the Pioneer became a familiar site on the streets of Kokomo, as Haynes worked to improve its speed, reliability, and maneuverability. In February 1897, the Duryeas became the first automobile manufacturers in the United States when they offered a car for sale to the public. By 1900 over thirty other manufacturers had joined their ranks, including the Haynes-Apperson Corporation of Kokomo. Starting in 1895, Haynes and the Appersons produced a couple of cars for sale to individual clients. In 1898, they built their own automobile factory with the capacity to produce about 200 cars a year. With demand far outstripping the supply, most of their automobiles were sold before they were even built. The year 1901 was pivotal for Haynes, who finally quit his job with the Columbus Construction Company and parted ways with the Appersons. While the brothers went on to produce smaller, less expensive cars, Haynes remained in the luxury market. Haynes also took a conservative approach in running his factory; producing 240 cars in 1901 and 350 in 1909. By that time, rival Henry Ford was producing and selling over 10,000 Model Ts annually, a figure that would expand greatly after he opened up his Highland Park, Michigan, plant in 1909. In 1911 a fire at the Haynes factory finally spurred Haynes to modernize and enlarge its production capacity. After it reopened, the Haynes Corporation reached a production peak of 7,100 automobiles in 1916. At a time when Ford and General Motors aggressively sought a mass market for low-and medium-priced automobiles, Haynes continued to sell to the luxury market. In 1908, for example, Haynes sold two models, a five-passenger runabout for $2,500 and a seven-passenger touring car for $5,500. That same year, Ford sold the innovative Model T for $825. Through his experiments with metal alloys, Haynes had long sought to create a lightweight yet stronger form of steel for use in the manufacturing process. In 1912 he received patents covering his invention of tungsten and cobalt-chromium alloys, which he marketed under the name "Stellite." As an early form of stainless steel, Stellite was immediately successful for use in machine parts and such consumer items as silverware, knives, and jewelry. His new company, the Stellite Corporation, reached over $1 million in sales in 1915-16 and grossed over $3.6 million in 1918. Despite the success of Stellite, however, Haynes earned a reputation as an owner who was unconcerned with his workers' safety. According to some published accounts, injuries were a daily occurrence in Haynes's factories, but Haynes never improved his companies' safety records. Haynes was stingy with his wages, never giving bonuses and paying only 17.5 cents an hour in 1915 for an 11-hour day and six-day work week. In 1920, Haynes transferred the Stellite Corporation to Union Carbide in exchange for an estimated $1.6 million in stock; the stock dividends provided Haynes with a $500,000 annual income. Unfortunately, Haynes's interest in his automobile company was not as lucrative. Refusing to budge from the luxury car market, the Haynes brand was hit hard by a slump in auto sales in 1921, and it never recovered from the loss. The company closed in September 1924, throwing at least 400 workers out of a job. The following year, on April 13, 1925, Haynes died in Kokomo, Indiana, after a brief illness probably brought on by heart failure. View the full website biography of Elwood Haynes.